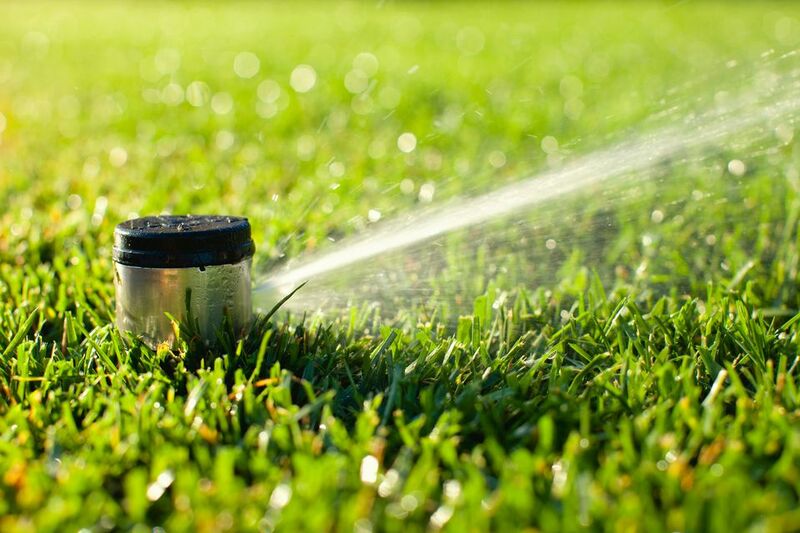 Valves in lawn and garden irrigation systems control water flow to specific zones within the system. Valves are typically located inside a valve box, which may contain four or more valves, depending on the system layout. Common symptoms of a faulty valve include leaks around the valve or at the sprinkler head farthest from the valve (indicating the water doesn't completely shut off), inadequate water delivered to the sprinkler heads, or the sprinkler heads simply not coming on. Replacing a valve is an easy job that requires basic plumbing supplies. The most important part of this project is getting an exact replacement part for the sprinkler valve. Determine the type and size of the valve, or remove it and bring it to the store with you. When selecting the new valve, make sure the PVC adapters fit the valve sockets before leaving the store. These adapters have a male threaded end to attach to the valve and a female slip-fit end designed to be solvent-glued to PVC irrigation pipe. Shut off the water to the irrigation system by rotating the valve handle on the main supply pipe of the system. The valve is closed when the handle is perpendicular to the pipe. If there is no shutoff valve for the irrigation system, you may have to shut off the water at the home's main shutoff or at the water meter. 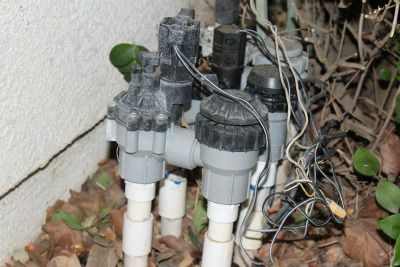 Note where the low-voltage wires are attached to the old sprinkler valve. This is important because you must connect the wires to the new valve in the same way. It's a good idea to arrange the wires so that each can be seen clearly, then take a photo of the wiring with a smartphone or digital camera. When you're ready, disconnect the wires from the sprinkler valve. Cut through the PVC irrigation pipes just below the old PVC adapters, using a reciprocating saw, hacksaw, or PVC pipe cutter. Cut as close as possible to the old fittings to conserve the maximum amount of pipe length. The new sprinkler valve will be only slightly lower than the old one. Remove all plastic burrs around the cut edges with a utility knife or sandpaper, being careful not to let the debris drop into the pipes. Note: With the system shown here, the local code requires that the anti-siphon sprinkler valve must be at least 6 inches above the highest sprinkler head in the same zone when the head is in the popped-up position. Check with your local building department for specific height requirements that apply to your project. If your valve will not be high enough to meet the code requirement, you may need to use couplings and some additional pipe to raise the sprinkler valve to a higher position. Install the new PVC male (MIP) adapters into the new sprinkler valve by wrapping plumber's tape around the threaded end of each adapter and threading it into one a valve socket. Tighten the adapters with tongue-and-groove pliers, being careful not to over-tighten them, which can crack the plastic parts. Apply PVC primer and solvent glue to the insides of the female adapter sockets and to the outsides of the pipe ends, following the manufacturer's instructions. Fit the new valve onto the pipes, pushing down until the pipes are seated fully into the adapter sockets. Let the PVC solvent glue dry as directed by the manufacturer (usually two hours before testing). Connect the wires to the new valve in the same configuration that was used with the old valve. Turn the water back on by slowly rotating the shutoff valve's handle so it is parallel to the supply pipe. Check the valve and all connections for leaks. Verify that you installed the wires correctly by making sure the timer works with the new valve.